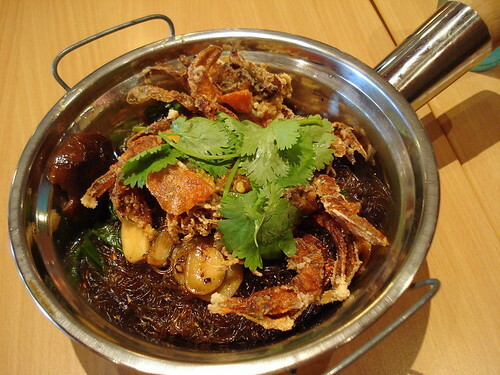 Thai Express Black Pepper Soft Shell Crab Tanghoon, originally uploaded by Camemberu. OK, 'new' as in 'new for me'. I haven't been to Thai Express in such a *long* time. These 'new' dishes probably have been on the menu for quite a while. Anyway, the Black Pepper Soft Shell Crab Tanghoon (S$12.90) piqued my interest. I've been hankering for some black pepper crab but just too lazy to go eat it. Black Pepper Tanghoon, originally uploaded by Camemberu. Turns out it's more like black pepper tanghoon topped with a couple of deep-fried soft shell crabs. They gave me a large meaty female crab with roe - ah, such a pity, as crab roe is wasted on me. I don't like it at all, it reminds me of uni (sea urchin roe) a little. I spent a lot of time dissecting the crab and scraping the roe away (oh are those screams from rabid roe-lovers I hear?). The dish kept a piping hot temperature for a long time (not sure if it's the function of the double pot). 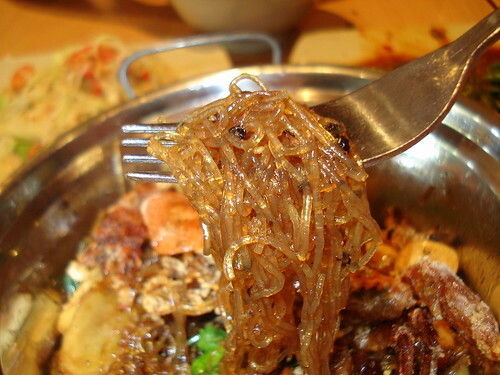 The tanghoon was potently flavoured but watch out for those huge thick slices of ginger and garlic. Thai Express Kailan with Shrimp Paste, originally uploaded by Camemberu. 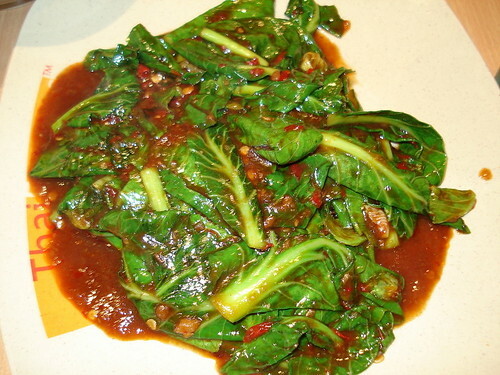 We also took the Kailan with Shrimp Paste (really sambal belachan). The taste was superhero strong and over-powering! Not necessarily in a bad way, but extra sweet, salty, spicy and all flavours augmented. Bits of dried shrimp added savoury bite. Really need lots of plain rice with this. Hubby lapped this all up. Thai Express's quality can vary from outlet to outlet, and even within the same outlet from time to time (as chefs move on, I guess). The Siglap branch today served a watered down version of their regular tom yum goong and even the som tum was not quite the same. I think I'm going to cook tom yum and som tum more regularly at home. can go try the fish fritter tomyam at the kopitiam at the T-junction of Tyrwhitt and Kitchener roads. Oh, my first reader recommendation! Thanks, budak! Yes, I have heard of this place before. Will try it out soon!